We recognize homeowners face a variety of issues concerning electrical services. From new houses, to room additions, to new garages, to to retrofitting, including electrical panel replacement, and interior or exterior lighting. In addition, we can help you reduce your monthly electrical costs with the installation of a solar electrical system. 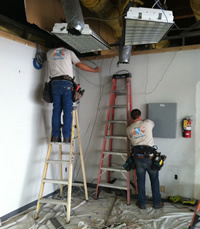 One piece of advice we can offer, use a licensed contractor for any of your electrical service needs. A licensed electrical contractor will ensure that quality materials are used for your safety and to meet building codes. 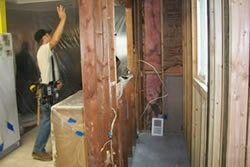 In addition, a fully insured and bonded contractor and will offer you peace of mind for your investment in your home. Our customer base includes major supermarkets, chain stores, radio and TV stations, and auto dealerships. If you are moving into a new space and need TI (tenant improvements), we can work directly with or through your general contractor to provide new installations or retrofit the existing installations for all your electrical services. We also offer support contracts for your ongoing electrical needs such as maintaining your interior and exterior lighting. In addition to residential and commercial buildings, we also service the electrical needs of industrial locations such as warehouses and light manufacturing plants. Often your location requires maintenance of lighting fixtures that are difficult, under most circumstances to access, and use large flood lamps for lighting. We offer monthly service contracts to maintain your lighting fixtures. In addition, many of our business customers have benefited financially by retrofitting lighting and lighting control equipment. modern, more efficient lighting technology can substantially reduce the monthly cost of power. A C Electric has helped organizations and companies, indirectly, by working with many general contractors and, directly as their electrical contractors, with a host of electrical needs.